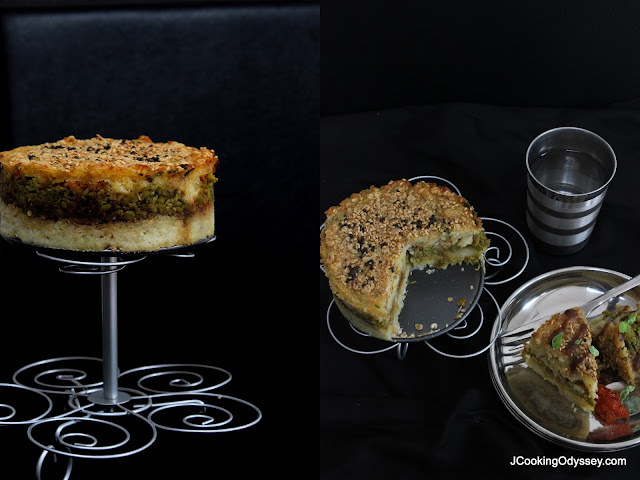 Jagruti's Cooking Odyssey: Bateta, Vatana Oats No Handvo - Potato , Green Peas ,Oats savoury Cake ! Bateta, Vatana Oats No Handvo - Potato , Green Peas ,Oats savoury Cake ! Whenever we make handvo at home, I always follow the traditional handvo recipe. It is such a hit in our house that I always have to make extra so we can eat it for the next 2/3 days! My son in particular is a huge fan of handvo and can't wait to eat it as soon as it is out of the oven. The handvo topping is always grabbed first by him - it's his favourite part! Me and my husband always like a slice with a nice cup of masala tea! Handvo is basically a favourite in gujarati households. It is a spongy, savoury cake made mostly from lentils. Ginger and chillis are incorporated into the lentil batter to make the handvo lightly spiced. The topping has to be the best part though! 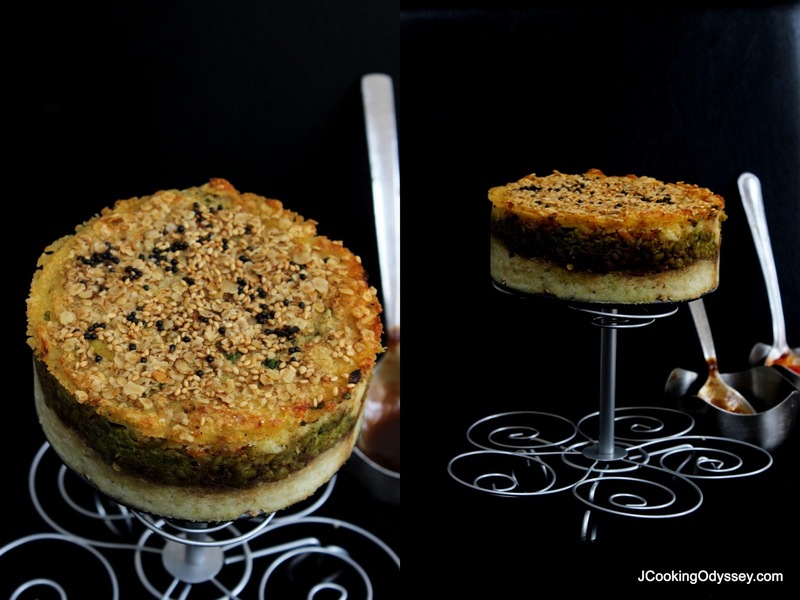 Tempered sesame seeds make the topping so delicious and crunchy that that should be a completely different recipe in its own right! Funnily enough, I still haven't posted that recipe on my blog. Even pictures are ready too, I definitely will do some day! For the first time, however, I've decided to broaden my handvo horizon and make handvo made with potatos. Its basically a layered handvo with an alternating layer of spicy mashed potato and blended peas and crispy layers of toasted Oats !! The end product was delightful! The slightly sweet , sour and spicy taste of the handvo was still gujarati authenticity but with a twist! Even this was eaten with the same enthusiam as traditional handvo if not more! This recipe defnitely goes down in my "make more often" list! Method :- make peas layer first. Pre heat oven to gas mark 5-6 . First heat 1tbsp oil in a heavy bottom pan or kadai, add mustard seeds and hing. When splutter add sesame seeds and chilli ginger paste, saute for few seconds. Add crushed peas, salt, garam masala, sugar, lemon juice and mix well. Cook mixture on a low heat for few minutes , then on high heat for 2-3 minutes. Make sure mixture is cooked well and dry like kachori or samosa mix. Place all the potato layer ingredients in a large bowl, mix well and leave it aside. Heat 1tsp oil in another pan and roast rolled oats till light pink or golden. Take one cake tin ( spring form is better ) and grease with little oil. First Sprinkle 2 tbsp roasted oats evenly in the cake tin , then spread evenly half amount of potato mixture. Now pour few spoons of all the chutnies. Spread all the peas mixture and once again pour few spoons of chutnies. Now spread another layer of potato mix, spread evenly. Sprinkle left over roasted oats or poha. In a small pan heat 2 tbsp oil, add mustard seeds when splutter, add dry chillies and sesame seeds. Pour this vaghar evenly on the potato mix. Bake handvo at least 45-50 minutes in a pre heated oven. Serve with left over chutnies. This cake is just gorgeous, Jagruti! I'm so intrigued by the layers of flavor and texture and the topping definitely looks so tasty! its perfect to feed for meal , forget about snack. love it. Oh Jagruti that is such a creative way of presenting a Handvo. Love the clicks and the recipe. Looks so yummy. HI Jagruti, first time commenting on your Blog, though I have been a lurker! I think your pictures above are absolutely GREAT! The pics caught my eye instantly, and I scrolled down slowwwwly enjoying each frame. The composition is wonderful too. Congrats on a fantastic job, very very well done. Hope there is a contest for Best FoodPics, you will surely win hands down!! And the recipe is great too! Thank you Mrs Singh for your lovely and kind words..:) Please do visit again.. Thank you Kellie :) With oats it was extra delicious !! Yummy! It's been ages since I made handvo. Your photos inspire to make it again! Have one query, if I use poha instead of oats, do I need to soak them? Thank you very much ! No you don't need to soak the poha. Thanks Jagruti for the prompt reply. I made this handvo today, but the green peas layer was falling off for want of binding. This is such an interesting recipe, I am definitely going to try it .its very creative and I am sure it tastes super. This is a wonderful n creative twist that I have to try.